My Cancer Journey – Chemo Ends with a Nice Surprise! | Grammy's Life . . . So Far!™ Dedicated to the seasons of a woman's life. My Cancer Journey – Chemo Ends with a Nice Surprise! I haven’t written about my cancer journey since back in September, because I have been having chemo all this time. My last chemotherapy was on December 12th. I was still fatigued for a few weeks, so my daughters and my husband did all the Christmas decorating and baking for me. It was fun to hear the girls laughing and watching Pride and Prejudice from my place on the couch. My job was to guard the Christmas tree, as our mini-schnauzer, Tatiana, had learned that she could drink water from under the tree. Sarah had to go home that evening, but the other two girls spent the night. They played the piano and sang Christmas carols and we watched Elf. It was a great Christmas, celebrating my last chemotherapy. Then came the surprise. 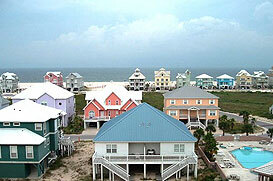 We had rented a beach house at Fort Morgan just outside of Gulf Shores for several years. My mom had called about renting the beach house again for the summer. The man asked about our family and Mom told him about my cancer. He had a close relative who had just finished treatments. He offered us a free week at the beach house the week after Christmas. My doctors agreed that I could wait a week to start radiation so that we could make the trip. My husband and I went with my mom and dad, two of my daughters, and my nephew Zack, who was off for the holiday. Unfortunately, it was just about as cold at Fort Morgan as it was in Louisville. We didn’t care. We bundled up and walked the beach. We saw any attractions that were open. We read, played games, and watched movies. It was a restful week. 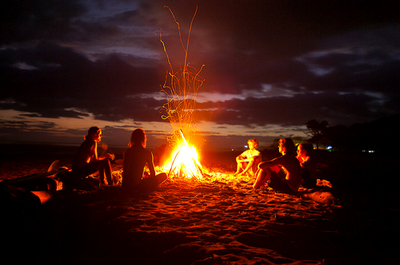 On New Year’s Eve, my dad built a bonfire on the beach, and we took our lawn chairs and sat around it. Somebody, I think my mom, suggested that we each talk about something we were grateful for in the last year. I was feeling a little grumpy about this, because I felt that it had been a rough year. But everyone had something to share. I was surprised when my daughters talked about the last year and my cancer treatments. They said that they had grown closer and that they had learned good lessons about suffering, among other things. Tears were rolling down my cheeks as I listened to them. I realized that my gratitude was that so far my life had been spared for times like these, and what a blessing the small moments are. I learned a lot from my family that night. I think this is one of my favorite New Year’s Eves ever, except of course for the New Year’s Eve when I became engaged to my future husband.. I am happy for. You have indeed taught those around you a lot about strength and courage and moving forward through tough times. It was not a path I would have chosen, but I learned a lot through the experience and became a stronger person. Thanks for your comment! My family has been through the trials of cancer, surgery, chemo, and radiation so I do understand how difficult it can be and how much stronger the patient and those around them can become through the process. My 82 year old mother had a mastectomy in October of 2013 then chemo and another mastectomy in August of this year. She just had her last radiation treatment on December 22! I think any one of us, her three daughters, would have gladly stepped into her place to save her the challenges but she showed us all what strength and faith are all about!